Results are still trickling in from more remote regions, but there can be little doubt now that Indonesia has a new president. What's more, the challenger, Susilo Bambang Yudhoyono, appears to have secured victory over the incumbent, Megawati Sukarnoputri, by a whopping margin. Mrs Megawati, who came to power three years ago, seems to have been punished by voters for not delivering the reform agenda she promised. "Indonesians are really disappointed with the government's performance," said Daniel Sparingga, a political scientist at the University of Airlangga in Surabaya. "They [the government] had their chance but they never used it. Corruption is getting worse, law enforcement is weakening and unemployment is becoming a really big problem," he said. In fairness, Mrs Megawati did bring a period of relative stability after the turbulence of former President Suharto's downfall and the regional financial crisis which hit Indonesia especially hard. But stability - critics would call it inertia - is no longer enough. By voting for a new president, Indonesians are demanding better. So is Susilo Bambang Yudhoyono, or SBY as he is popularly known, the man to lead this sprawling archipelago towards a brighter future? After all, both he and his vice-presidential running mate, Jusuf Kalla, were senior ministers in Megawati Sukarnoputri's government. The election campaign offered few clues as to the kind of changes a Yudhoyono administration might represent. He and Mrs Megawati both ran on secular, nationalist platforms. Both promised to boost Indonesia's underperforming economy, root out corruption and improve security. Neither gave much detail on how they would achieve all this. Fachri Ali, a political observer, believes Indonesians made their decision on the basis of personality as much as anything else. "You see SBY has charisma, SBY can talk and SBY knows how to express his opinions while Megawati sometimes has problems answering questions," he said. But Mr Ali warned that the new president would now be under pressure to back up his words with action. "We don't know yet whether he can fulfil his promises or not. 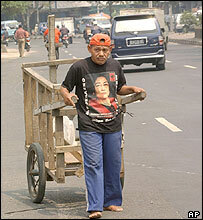 But if his work is just the same as the Megawati government, people will desert him." Mr Yudhoyono has promised to spend the early part of his presidency focussing on corruption. So it is possible that a few high-profile characters will be brought before the courts. But probably not as high-profile as former President Suharto, who has been indicted on charges of massive misappropriation of funds, but who is deemed too ill to stand trial. The more likely candidates are members of the financial community accused of embezzling money meant to bail out the banks in the wake of Indonesia's currency crisis. A few big fish would go a long way to showing Mr Yudhoyono means business. But the problem is that Indonesia's justice system is itself widely perceived to be corrupt. At the very least, the courts have shown themselves to be inconsistent, bordering on incompetent. Reform is desperately needed. According to political chatter, Mr Yudhoyono may introduce some changes at the top, with a new attorney general, perhaps even a new police chief, in the offing. For much of the presidential campaign, security didn't feature much as an issue. But a bomb attack outside the Australian embassy in Jakarta on 9 September changed all that. As chief security minister in Mrs Megawati's government Susilo Bambang Yudhoyono was the point man in Indonesia's war on terror. He takes a tough line on militant violence, promising to hunt down those responsible. But there has been no clear indication he will be more willing than his predecessor to tackle the roots of the problem. Anyone looking for his government to make banning the regional extremist network Jemaah Islamiah an early priority could be disappointed. Few Indonesian leaders, political or religious, are willing even to use the name in public for fear of alienating a predominantly Muslim population. And what of the separatist violence which still flares at either end of Indonesia, in Papua and in Aceh? Mr Yudhoyono is often credited with trying to keep the peace process in Aceh going long after it had run into the ground. On the other hand, he was also in the cabinet when the decision was taken to launch a massive military assault against the Free Aceh rebels in the hopes of using force to the end the long running conflict in the province. Sixteen months later, the fighting goes on with no end in sight. Interestingly, in the presidential contest, Mr Yudhoyono won in Aceh by a considerable margin, so perhaps the Acehnese are willing to give him the benefit of the doubt. Supporters say that as a former soldier himself, Susilo Bambang Yudhoyono will be better placed than Mrs Megawati was to control the military, which remains a powerful force, despite having its formal political role removed. But given the security forces' appalling human rights record, there are also people who are distinctly nervous about a retired general coming to power in Indonesia. Here Mr Yudhoyono has a tricky balancing act to perform. He has to provide the strong leadership Indonesians are looking for, without appearing to step over the line into the authoritarianism they have fought so hard to leave behind. Political scientist Daniel Sparingga thinks Mr Yudhoyono should impress himself on the military early on. "What he has to do is create a new network, change people in the military and put in people he can trust and work with," he said. "That way it'll be easier to control the military, but it's not going to be easy." The next president will also have to work with parliament, and here Mr Yudhoyono could be frustrated. His Democratic Party has only 8% of the seats, in a parliament dominated by Golkar, the party of former President Suharto, and Mrs Megawati's PDIP party. "An SBY government could have a lot of problems if it doesn't get enough support from parliament," said Fachri Ali. "There are many policies, like changing the chief of police for instance, that will need the backing of parliament, so SBY is going to have to work on that." 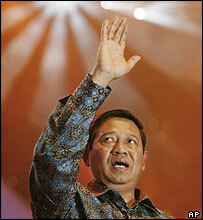 The challenges facing the next leader of Indonesia are many and varied. But at least Mr Yudhoyono knows that he was chosen by the people. He has a huge mandate for change, and the people who voted for him expect him to honour that.